If you're reading this post, then you know the importance of building your email list, and because of that, I am SO proud of you! First off, job super well done on that. You are absolutely correct that your email list is the most valuable thing you have in your business (right after yourself of course)! Okay, so email lists are important. Got that. Now, how do you build your list? 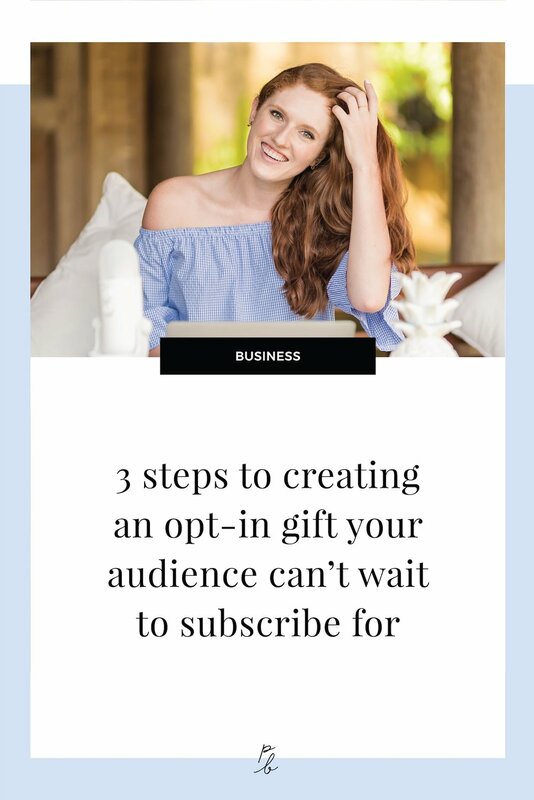 There's a ton of options for building your list including ads, giveaways, webinars, etc., but the easiest way to get started (for free) is to create an opt-in gift. If you've just had a 'subscribe to our newsletter' option on your website before, be prepared to have your socks knocked off, a killer opt-in gift will absolutely explode the growth of your list compared to what you're seeing now. Now, notice how I said a 'killer opt-in gift'. Some opt-in gifts will fall flat and do a whole lot of nothing for your business, and I don't want you to waste one minute of your precious time on something that isn't going to move the needle in your business. So, here's the steps to creating an opt-in gift that your audience just can't wait to get their hands on! If you've read this blog at all before (you're the best 😉!) then you know I loveeee to go on about the importance of knowing your ideal clients, or in this case, your ideal audience that you want to make into your clients! Before you can decide what opt-in gift to create, you really, really, really need to know who the heck you're even trying to attract. If you haven't truly nailed your ideal client avatar, you're going to want to open up these posts in a new tab, do the ideal client work, and then come back to this post to create that fab opt-in gift. I can't stress this enough. Your opt-in gift will do a whole lotta nothing for your business if you don't really know your ideal clients and their struggles. You can either create a gift that solves the biggest problem they're currently facing or create an opt-in gift that helps them do the pre-work before buying one of your products or services. How do you determine the biggest problem your people are currently facing? Pick up the phone and chat with some of your people. I do this by emailing my subscribers once a year, inviting them to schedule a time via my appointment scheduler, Acuity, to chat with me. An opt-in gift should help a person solve one specific problem, instead of trying to solve 10. So whatever their biggest struggle is, that's what we want to help with. To do: Write down their biggest struggle and outline how the gift will help solve that problem. Option 2: create a gift that helps them do the pre-work before buying one of your products or services. Ask yourself, when someone hires you for a service or buys one of your products, what do they need to do and have ready in order to even get started working with you? For example, if you're a logo designer your client needs to know their brand vibe and their brand positioning and the why behind their business. Or if you're a wedding invitation calligrapher you'll need to know the different pieces they'd like in their invitation suite, how many guests they'll have and ensure your clients are up to speed on wedding invitation etiquette so they give you the content correctly for the invited guests. You could write down a list of things your client needs to prepare in order to work with you and then create a preparation guide for them as an opt-in gift. Your gift would then help them work through that client pre-homework so they can hire you and be fully ready to get started. The format you create your opt-in gift in really does matter. Some formats have a higher perceived value than others. And we want you to give away something people will be lining up around the block to get their hands on, so I want you to create something with a really high perceived value. While you may be giving away the same content, getting that content in ebook format or video mini-course format really changes how valuable people think your gift is. While ebooks are one of the easiest opt-in gifts to create, I'd suggest not calling your gift an ebook, just because everyone and their brother gives them away and so they're not seen as all that valuable. If you're going to create a PDF of some sort, you could call it a 'workbook' 'checklist' 'toolkit' 'printable' or 'guide'. They're all basically the same thing as an ebook but have a higher perceived value. I had held a webinar series a few months back teaching subscribers how to create a complete website building game plan. It was 4 hours of video content along with 3 workbooks and 1 checklist. It's now available on my site as a mini-course opt-in gift! Now tell me, would you rather a mini-course with 4 hours of video, 3 workbooks and a checklist or an ebook ...? So be sure to pick your format wisely to really ensure your people are excited to subscribe to get access!